Care Home Relocation Packers and Movers in jalandhar we offer Specialized top quality movers services provider Jalandhar to all India. 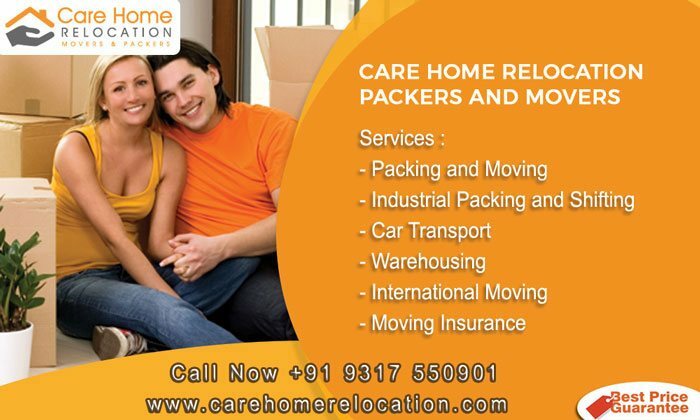 Care Home Relocation provide total solutions for relocation at affordable cost within city /within India of all your packing & moving services, Warehousing services, Car Transportation services, Industrial packers services. You can call us at any time, we will reach you on time and let you transport anything on time. We can expertly handle all your storage and warehouse needs such as Household Goods Storage, industrial goods safe storage, electrical items storage, furniture item storage, commercial storage & relocation, office goods storage, vehicle storage etc. We have outstanding expertise and long experience in the field of Warehousing and Storage with professional and trained workers. We have great communications and special programs to give your relocation a way that is as easy as you want. Security for Warehouse Storage is the supremely important thing for us and is our topmost priority. We have proper security staff to look after your goods and articles in our warehouse sites. We guarantee you safe and reliable storage service for your goods with 24/7 safety appliances. Office shifting or commercial relocation is not an easy and short time method. If you want a better and safe workplace shift, you need a good preparation. Some time you want move your office very shortly and in low cost. You can trust on us. Because we have many qualified staff that will help you to relocate your office as soon as possible and we could not take unnecessary price from our customers. We know how much important product you use in your workplace So we always use wooden box during transportation. Care Home Relocation are experts in providing domestic relocation services within the cities, local shifting services, home relocation services which are designed to meet all the expectations of our valuable clients. Before proceeding to any work, we analyze the requirement of our clients, discuss with them to provide safe and secure relocation services. 100% punctuality and comfortable relocation is also considered in all our moves.When you work with us you will benefit from our unrivalled nationwide network of offices and warehouse facilities in Chandigarh, Mohali, Patiala, Baddi, Ambala, Agra, Shimla, Jammu and Hoshiarpur. Whether you are moving within your current city or town, or moving longer distance from urban centre to another urban centre, or from multiple sites / to multiple sites – we will provide you a comprehensive obligation Online Quote. Our domestic relocation services comprise of household goods relocation, commercial goods, office relocation and car transportation etc. Our professional and experienced surveyor we will provide a professional and competitive quote based on your needs. Alternatively we can also provide a quote via our online request form or by telecommunication. We will do our best to help you achieve a quote that suits your budget and your requirements.